Performance Time: Approximately 60 minutes, 44 pgs. MUSICAL COMEDY. In the murky depths of a Scottish loch, Priscilla, a teenage sea monster, yearns to leave her parents’ cold, dark, dingy lair and set out on a quest to discover whether the fabled “land-dwelling creatures” she’s heard about exist outside of sea monster lore. Horrified that Priscilla would want to leave the safety and comforts of such a wonderful lair with its abundance of silt, slime, and algae, Priscilla’s parents and granddad try to convince her to stay home and avoid the fate that befell her long-lost brother, Reginald, who mysteriously disappeared after he set off in search of the famous Loch Ness. 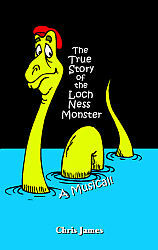 Meanwhile, in the town of Kinlochleven, Campbell Steward hatches a plan to save the dying town and prevent the Toxoplast Corporation from building a toxic waste facility by cashing in on the Loch Ness Monster craze. This adorable musical features Scottish highland dancing and eight original songs that will delight audiences of all ages. Chris James is a teacher, songwriter, and the author of several musicals. Mr. James teaches at Westbourne Grammar School, where he enjoys directing and producing musicals and plays. Originally from England, he lives in Melbourne, Australia, with his wife Caroline and his twin sons Rory and Albert. Vera Hillas has been a music educator for more than 20 years and has extensive experience as director, producer, and music director. A graduate of The University of Melbourne and the Australian Catholic University, she teaches music and visual arts. Ms. Hillas lives in Melbourne, Australia, with her husband and two sons.